COLONIE — According to the raw data, Albany Shaker Road isn’t that bad of a drive. So long as there isn’t a delay on I-90 or I-87, there isn’t a crowd at the Crossings, it’s not when school is in session and there aren’t any school buses, and it’s not garbage day and there aren’t any garbage trucks, and nobody has the audacity to try and make a left hand turn on the stretch of road that sees some 16,000 vehicles a day. So, at 3 a.m., on any given day, traffic on Albany Shaker Road flows like wine. And, on paper anyway, the road was designed to accommodate the smooth flow of not just vehicles but pedestrians and bicyclists too. In other words, Albany Shaker Road is a “complete street” according to Don Adams, of the engineering firm Creighton Manning which is currently conducting a traffic study of a 2.43-mile stretch of Albany Shaker from Everett Road to Old Maxwell Road. Residents who packed the Albany Shaker Road Loudonville Fire Department on Tuesday, June 13, to express their concerns about the road got a good chuckle out of some of that raw data and what pictures on a piece of paper may indicate. through a half dozen or so times before catching a green light. Have experienced the increase in traffic as land along the stretch of road is developed. And have been told before something would be done. According to the data, traffic hasn’t gotten any worse – and certainly not any better – on the road that runs west to east between Route 155 and the City of Albany line in at least two decades. That stat makes sense, said Adams, because there just isn’t any room for any more vehicles at peak travel times. In fact, the road, which is owned and maintained by Albany County and is officially known as Route 151, has been a busy, regional thoroughfare dating to the 1700s when it was a farm to market road between the City of Albany and outlying farms in what is now Colonie. Over time, while the road has served the same regional thoroughfare purpose, neighborhoods and other development have sprung up around it. The posted speed limit is 40 mph, and Adams said the 24-hour average is 35 mph – one stat which drew a few hoots and heckles from the audience. From 2012 through 2016, there were 294 accidents including three involving bicycles but none involving pedestrians. The majority, 32 percent, were rear ends and 31 percent were caused by someone failing to yield the right of way. People at the forum were asked to weigh in on different aspects of the road by dialing in to different numbers and those responses were automatically compiled and displayed on a large screen. Those without cell phones were given an opportunity to voice their feelings in longhand on paper. Of those responding via cell phone, the large majority, 67 percent, said traffic congestion was their biggest concern. A distant second was community character, with 15 percent saying that was their biggest concern and 13 percent saying it was cyclist and pedestrian safety. Everyone, though, would like to see something done. Common sense dictates that if you modify an already convenient cut-through so traffic flows faster, more traffic will come and jam up the works again. awful to live on, around or to drive every day. Engineers are looking for a balance between the two extremes and that’s not always easy or quick. There is another meeting slated for October and the input gathered, in part, from the first meeting, will be incorporated with existing data, and some ideas to mitigate traffic congestion — along with associated costs — will be presented to the public. 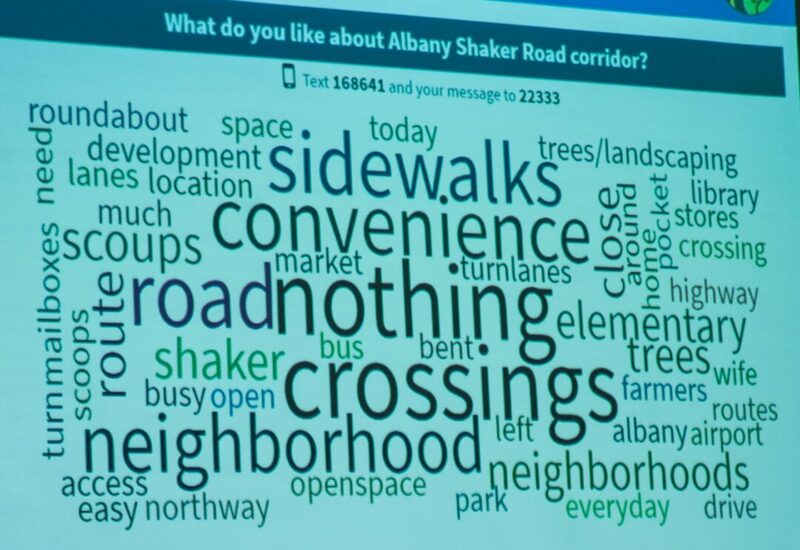 While on paper, Albany Shaker Road is a complete street in that there are sidewalks, an active bus line with 27 routes and technically a shoulder to ride bikes, many residents questioned how anyone could do anything on the road except drive and why anyone would be crazy enough to try. “How are you going to ride a bike to the crossing along that shoulder,” asked one resident. Development along and near Albany Shaker Road was also a concern among those in attendance, and the study will take into consideration what could be built on the vacant tracts of land without any specific plans proposed. The Planned Development District on Maxwell Road, located just off Albany Shaker, is a perfect example of what people do not want to see anywhere near their neighborhood. There is also a proposal working its way through the planning process to build a larger Stewart’s store at the intersection of Everett and Albany Shaker roads. Much of what was said at the meeting wasn’t too new to those in the audience – because they live it – or those doing the study. One quick fix that everyone seemed to agree would help move traffic along is a left turning lane at The Crossings – a 100-plus-acre park that opened in 2003. The park, with its new playground, rolling walking and biking trails, grassy fields and plethora of picnic areas, is a draw to people near and far and is packed on most nice days. 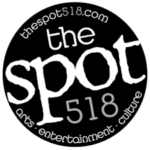 It also hosts a number of events like a concert series and a farmers’ market. There was some talk of making it more like the town park off Route 9, which is limited to Colonie residents and guests and where the town charges a fee. Her opponent this November, Frank Mauriello, the Republican minority leader on the county Legislature, said limiting access to The Crossings “might be difficult at this time” and instead pointed to the “unbridled development” he said the Mahan administration has allowed to occur along the Albany Shaker Road Corridor. Mahan said the Albany Shaker study is just one piece of the puzzle that should fit into the overall Comprehensive Plan that is currently being updated.